There are now 12, 1914-18 war casualties commemorated in this site. Of these, 1, is unidentified. All died in 1914. 25th September 1914, aged 34. INSCRIPTION. THE UTMOST FOR THE HIGHEST. Son of Donald Cameron of Lochiel 24th Chief of the Clan Cameron, and of Lady Margaret Cameron; husband of Hester V. Cameron (nee Fraser-Tytler), of Aldourie, Inverness. Gazetted Oct., 1899. 26th September 1914, aged 37. INSCRIPTION. PRO DEO PRO REGE ET PATRIA SANS PEUR ET SANS REPROCHE. 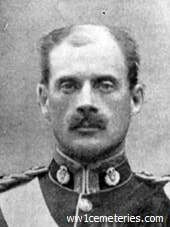 Son of Gen. Sir William Gordon Cameron, G.C.B., of Nea House Christchurch, Hants; husband of Constance Geraldine Cameron, of Fairley, Countesswells, Aberdeenshire. INSCRIPTION. THE SOULS OF THE RIGHTEOUS ARE IN THE HAND OF GOD. Son of Lady Maurice Fitzgerald and the late Lord Maurice Fitzgerald, of Johnstown Castle, Wexford; husband of Dorothy Fitzgerald. 23831 Pioneer Richard James Arthur, (Mentioned in Despatches), 1st Signal Company, Royal Engineers, died 26th September 1914. D/6214 Lance Corporal William John Baker, 4th Dragoon Guards (Royal Irish), died 13th September 1914, aged 24. Son of John and Sarah Ann Baker, of West Brome, Quebec, Canada. Born at Bristol. INSCRIPTION. GONE BUT NEVER FORGOTTEN. 7263 Private Robert Brown, 1st Bn. Cameron Highlanders, died 25th September 1914, aged 26. Son of Mrs. Catherine Brown, of Edinburgh. 3721 Regimental Serjeant Major George Penman Burt, D. C. M. 1st Bn. Cameron Highlanders, died 25th September 1914, aged 35. Husband of Annie Thomson Burt, of Old Meldrum, Aberdeenshire. INSCRIPTION. STILL FONDLY LOVED DEAR DADDY AU REVOIR BUT NOT GOODBYE. 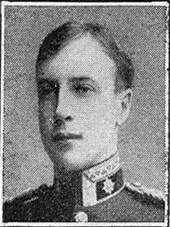 D/3927 Corporal Francis Charles Chapman, 4th Dragoon Guards (Royal Irish), died 13th September 1914, aged 27. Son of William and Sarah Chapman, of Timberscombe, Somerset. 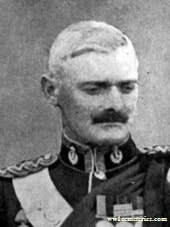 Lieutenant John Crocket, Royal Army Medical Corps attached to 1st Bn. Cameron Highlanders, died 25th September 1914, aged 28. M.D., Edinburgh. Son of William and Robertina Crocket, of Edinburgh. GS/6692 Private Harry Savory, D. C. M. 4th Dragoon Guards (Royal Irish), died 13th September 1914. Third son of Thomas William and Ellen Savory, of Warham, Norfolk; husband of Edith Savory, of Sculthorpe, Fakenham, Norfolk. INSCRIPTION. FIGHT THE GOOD FIGHT. 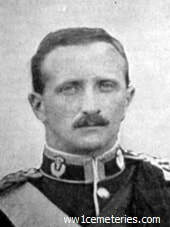 Was a settler in Rhodesia in 1896, and served throughout the whole of the Matabele War; served as Lt. in Imperial Light Horse, in the South African Campaign (Queen's Medal with 4 bars, King's Medal with 2 bars). Volunteered for active service at the outbreak of Great War.